The opening night of the Exhibition “Notre Histoire” (Our History) put an end to the reign of Nicolas Bourriaud and Jérôme Sans as curators of the Palais de Tokyo. Moreover, it celebrated a new faith in contemporary art as both had managed - in only a handful of years - to establish the young museum as a real platform for creativity. « When Nicolas Bourriaud and Jérôme Sans asked me to imagine an installation for that evening, I wanted to show how the Palais de Tokyo had become a landmark, a lighthouse for contemporary art. 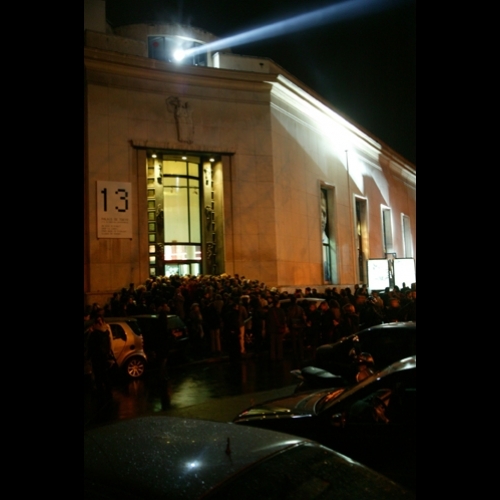 The installation “Vigile de la Culture” transformed the façade of the Palais de Tokyo into a lighthouse as a beam of light came out of its upper floor (as if shining from the heart of the building). Sweeping over the neighbouring streets, it also pointed at the Musée Galliera, symbol of the bourgeois culture of the 19th Century.